has the south and east trend begun for us north westerners? 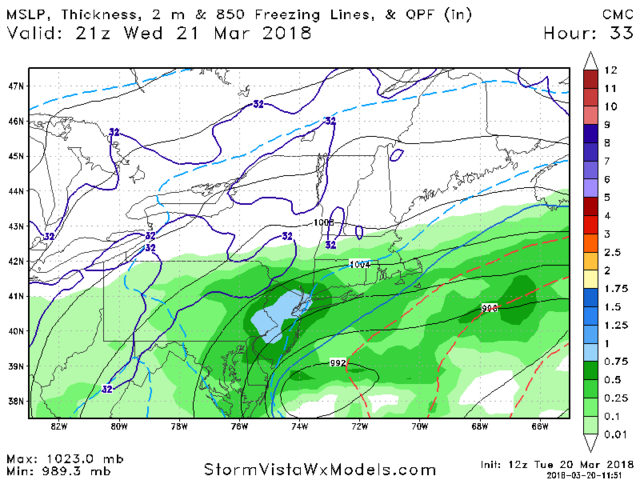 The Nam looks likes it backs in some nice precip into Thursday. 32* here with a dewpoint of 10*. Under this morning's thick cloud cover and with a chilly NE breeze the temperature has not risen a degree since 7 a.m. Unless that changes much in the next few hours, this storm should get going tonight with plenty of cold at the surface. Alex, next update 12PM? Or they wait till Euro and 2PM? Correct me if I'm wrong but the NAM shows surface temps below freezing this time for the duration of the heaviest precip no? 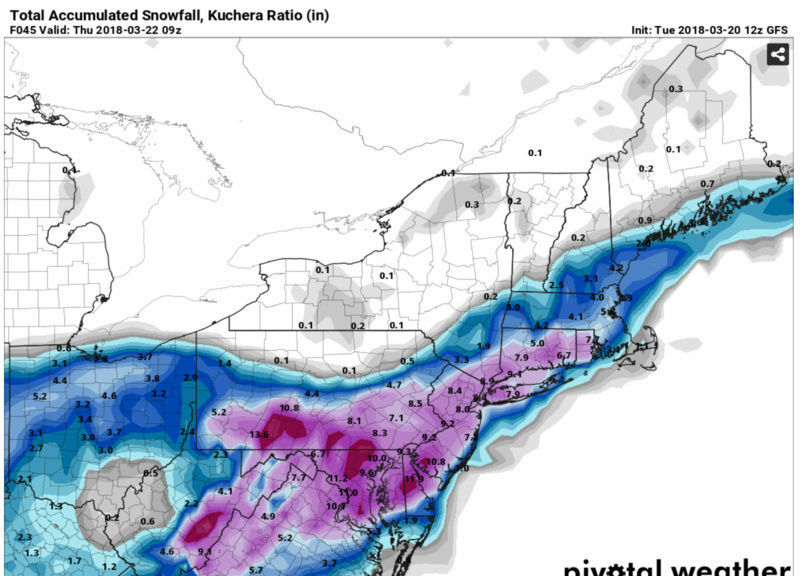 Are we still thinking 8:1 ratios and very wet snow again? billg315 wrote: 32* here with a dewpoint of 10*. Under this morning's thick cloud cover and with a chilly NE breeze the temperature has not risen a degree since 7 a.m. Unless that changes much in the next few hours, this storm should get going tonight with plenty of cold at the surface. 25 here Bill. Lots of cold air to filter down to you tomorrow and help you out. It's what we do in the HV. Peeps just look at all the latent heat in teh gulf states with the tornados and severe weather t-storm etc. This going to be a beast. Whenever you see this there are tremendous dynamics at play that models will under do. 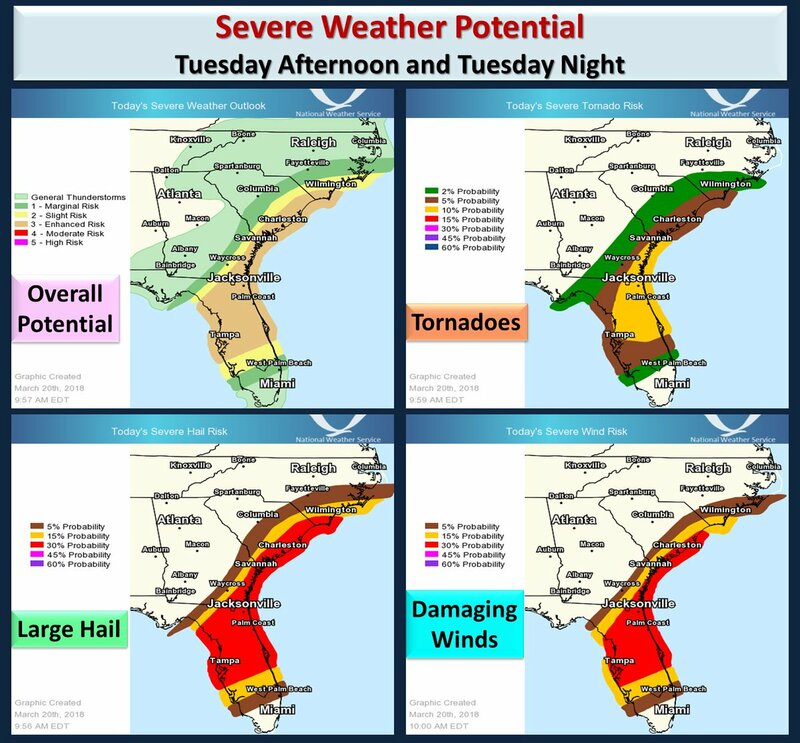 Not saying more than what NWS has put up but the possibility of over performing is on teh table from this observation. Much appreciated. You send the cold air down here tonight and tomorrow and I'll ship the heavy precip bands up your way during the day tomorrow after I'm done with them here. Currently moderate rain in South Jersey. Light snow in Philadelphia. Be interesting to see how far north that makes it during the day today. Seems to be making progress aloft, but the air is so dry over me now (32* temp/10* dewpoint) that I don't expect anything much to reach the ground in the next few hours. 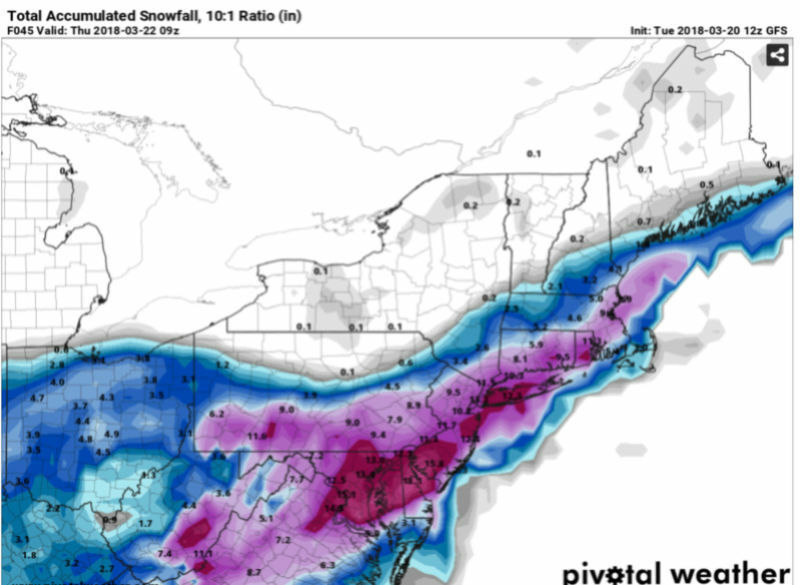 12z RGEM is Madonne. Note I am showing this in 2 hour increments. 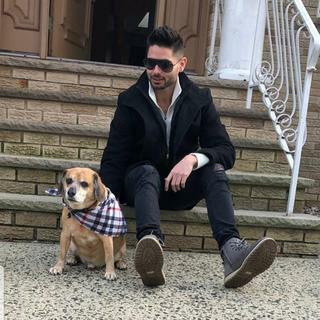 Frank- you anticipate blizzard warnings to go up in some areas? Frank, correct me if I'm wrong, but it seems the significant sleet threat for the coast has been basically eliminated or at most reduced to a brief period at the onset. 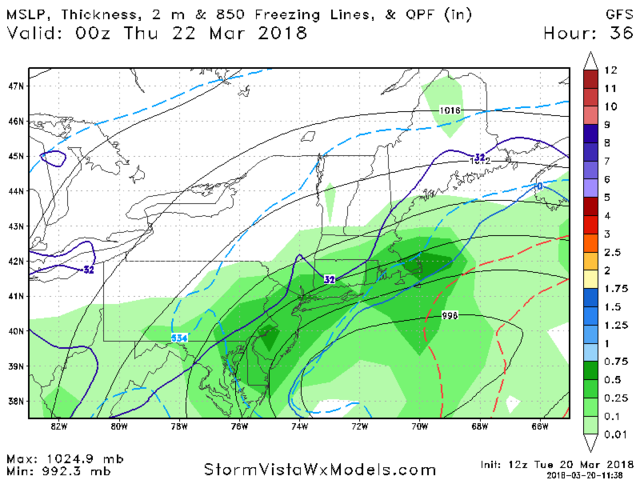 aiannone wrote: Frank, correct me if I'm wrong, but it seems the significant sleet threat for the coast has been basically eliminated or at most reduced to a brief period at the onset. For LI yes, some parts of JS, especially further south may have potential mixing until mid-day. This would be specific for extreme coastal areas. Check the skew-t's off of the 3km NAM for verification. There seems to be a warm nose in the mid-layers (approx 850 or so) for a bit. I would side for more sleet than a liquid p-type, though it would cut down on totals. 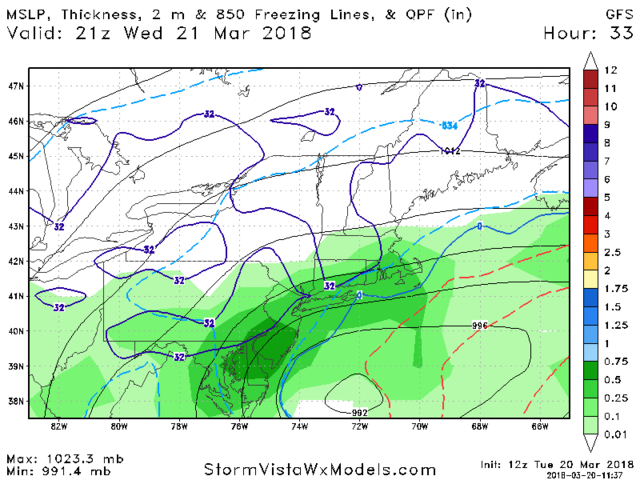 This is gone though by 18z or earlier but 850s are rather borderline until after that. Such that the amount of snow lost is equivalent to the length of time that sticks around. I would bet on the shorter rather than the longer given the track of the mid-level lows even with the strong WAA out of the east. Surface temps along the coast have to be watched during this time as well, though I am less inclined to worry this time around given the rates. Agreed. I don't like those 850 temperatures. dsix85 wrote: Frank- you anticipate blizzard warnings to go up in some areas?